Gartner estimates there are 8.4 billion devices connecting to the Internet in 2017–a 31 percent increase over 2016. By 2020, there will be approximately three smart devices for every person on the planet. With this rapid growth in smart devices, exploding data volumes, and the shift to the cloud, it is becoming more and more challenging to protect critical systems and information. Government and industry leaders convened at the Symantec Government Symposium in Washington, D.C. on Tuesday to discuss these complex challenges and the solutions needed to address them. 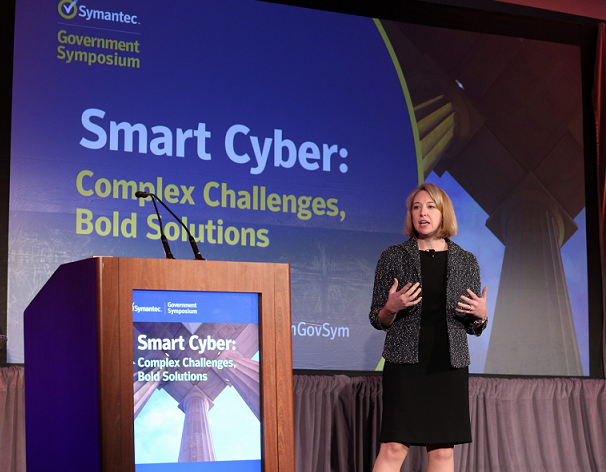 Jeanette Manfra, assistant secretary, Office of Cybersecurity and Communications at DHS, gave the morning keynote at the Symantec Government Symposium. In her morning keynote, Jeanette Manfra, assistant secretary, Office of Cybersecurity and Communications at the Department of Homeland Security (DHS), said we are at the cusp of a digital society, but still have a ways to go. Manfra said government–and society as a whole–is struggling with some of the same questions faced in the industrial revolution–like how do we take advantage of new technologies and not leave anyone behind? And, how do we ensure we are safe when building and distributing this new technology? Michael Fey, president and chief operating officer at Symantec agreed that the cyber landscape has changed drastically in the era of smart devices, and is even more complex. According to Michael Daniel, president of Cyber Threat Alliance, more and more things are connecting to the internet–adding to the IoT, and making it increasingly difficult to protect. Manfra agreed that we must change the way we think of defending our devices, and who defends them. Fey said education is the key to evolving with the complex IT landscape. Many of the lessons learned ten to 15 years ago are no longer relevant. IT teams need to stay up to date with training. Daniel said there are three main reasons why cybersecurity is challenging. Grant Schneider, the acting Federal CISO and senior director for cybersecurity policy at the National Security Council, said cybersecurity is about people–it is built, run, and attacked by people. To tackle complex cybersecurity challenges, we must understand people.